Mine doesn't and the manual doesn't show it. The access hatch came in for the Hot Shot II as far as I know. Probably clears it up then, orig hot & super no, hot 2 & re-re's yes. 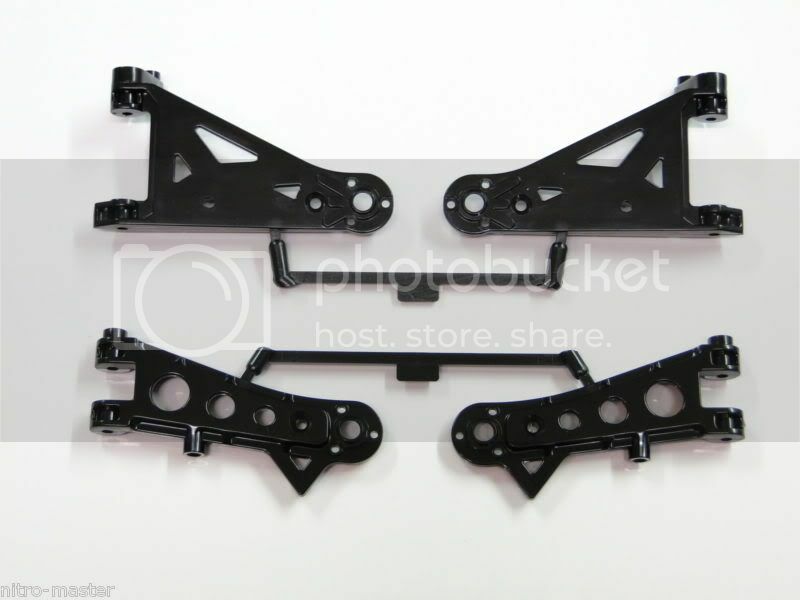 Any other differences in the chassis'? Original Hot Shot and Super Shot don't have the access hatch on top of the chassis. The access hatch first appeareance is on the Hot Shot 2 chassis, then on the re-release models. Also the bottom of the chassis is different. Newer one is larger to allows more rooms inside. Wow, my memory is going south as I remember my original Supershot having the access hatch. I had the hatch in mine, but only after breaking a chassis after the Hotshot II came out. The II chassis was much more useful when actually running the car. i have a original hotty and a re re top deck and bottom mech tray and a superhot . the re re bottom tray is the same as the original tray and every thing swaps over . my original hotty had a broke top deck when i bougt it and i orderd a new chassis kit and unlnowingly got a re re chassis , i then had to buy a bag of parts with the alloy cover . i ended up buying a ''new/old stock'' top deck from a ex hoppy shop . as stated before , most parts are interchangable .. it just looks funny on the super with all the unused brackets and mounts hanging out in the breeze ! i bought a set of new decals for my super only to find that the '' SUPERSHOT '' decal has been changed to '' super HOTSOT '' plus a few sponsors decals hanve changed too , lucky i found a set of '' alternative '' decals to use .. Original Super Shot had the same complex brass/steel hex ended prop shaft and prop joints as the Hot Shot, not the coathanger wire hook type. * Dogbones where the thinner ones, short brown front, and long black rear. The new Super Shot differs from the old one... It is basically has the same changes that the re-re Hot Shot had over the original, plus a few more changes to parts. The re-release parts have this feature too. The upper mounts are in fact identical to the originals, however the lowers are quite different as the L and R are stamped in a larger font and in a different place on the part. The colour is also different as the originals were a very dark brown but the re-re parts are jet black. The parts are also very slightly different in form as the edges are very sharp on the re-re whereas on the original they have a subtle roundness to them. That's a long list of differences. Thanks for compiling it. I've actually just wandered back into TC to brush up on the status of Tamiya's ongoing "re-imaginings" of their own work, but fortunately I'm OK Supershot-wise in terms of having collected any gear I would have wanted. But good luck to anybody aiming to restore a first edition of that car in 5-10 years from now when there are loads of hybrid vintage/rehash models around. Yeah, it's next to impossible now to find some of the original vintage parts. Glad I have a pair of complete original Super Shots. in 5 years will the re-re rims be as rare as the originals? I've allready seen pricces creeping up. But the opposite seems to have happened for the Supershot, looks like I got mine just in time. The parts that are unique to the Super Shot were expensive (body set, wheels, underguard) because they were both rare, and there was a fair bit of demand for them. The demand is still there, so prices will still be at a premium, and there are enough changes to the Super Hot Shot that original parts eg decal sets will still be rare and expensive. 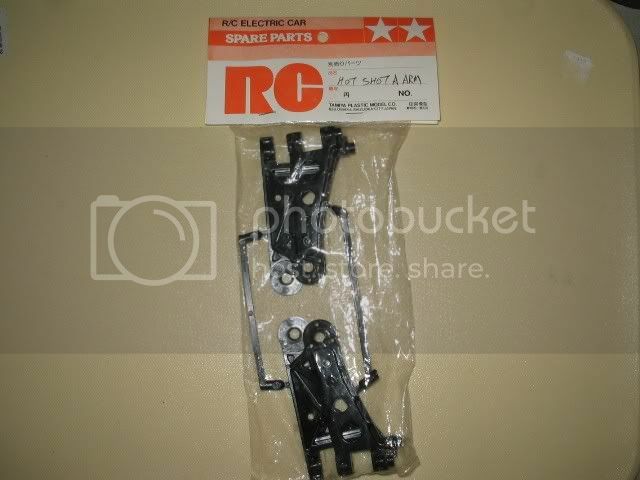 JR-RC was selling parts for a reasonable price, but resellers seem to have got a hold of a fair chunk of these popular parts and marked them up, which is why the prices appear to be creeping up again. If anything, re-releases tend to make finding original parts much more difficult. The suspension parts for the Super Shot will continue to be expensive, because people will want to buy them to hop up their Hot Shots. That's why Super Shot pressed parts bags were so expensive. Seemingly the bolded above is not true either. Just noticed these http://www.tamiyaclub.com/trades_model.asp...456&id=1675 in RA1028's trades. Ah, but those arms were used in a number of models, and that spare part changed over time. The Hot Shot, Super Shot and Boomerang all originally came with F parts with the tabs on the lower front arms. The Super Shot and Boomerang had an instruction to clip off that little triangle of plastic on the lower arm. My Super Shot came with F parts that had these tabs to cut off. My original Hot Shot has these tabs, but my reissue Hot Shot does not have them (obviously Tamiya weren't concerned about this little detail!). By the time the Hot Shot 2 and Super Sabre were released, the mould for that part must have been changed to remove that small plastic triangle as these cars came with the updated part, and presumably all spares manufactured from this point were also made from this mould without the triangular tab. So that bagged spare part must date from Hot Shot 2 era or later. I'm not sure if this revised part ever made its way into any Super Shot or Boomerang kits, but I haven't seen a copy of the Super Shot instruction manual that has the revised arms in the parts section and doesn't mention the step to clip off the small triangles - but I could be wrong? Yes, this is the big question. Did they supply Hotshot, Supershot & Boomerang kits with Hotshot 2 front arms from 1987 onwards? Until we get a decisive answer we cannot say that the Super Hotshot's F parts are different from a late production Supershot's. I wouldn't be surprised if they didn't bother to update the Supershot manual to illustrate the new moulding. To further muddy the waters, my re-re boomer came with little triangles on the arms complete with directions to snip them off in the instructions. Nah, I just checked my re-re Boomer and the lower arms definitely have the triangles already removed. The manual does not mention anything about removing them yourself either BUT step 14 on page 8 does clearly show lower arms with the triangles still attached. Methinks they forgot to update that little piece of artrwork. Actually there IS a way to differentiate between vintage Hotshot 2 F parts and those from 2007. The 2007s now have a tab on the moulding sprue whereas the originals did not. The actual parts themselves though are identical, so they would have to be still on the sprue to know which era they came from. Also confirms that RA1028's set are the real vintage deal. So when things like sprue tabs differ (or as in other cases, the embossed fine print of the re-release part will include recycling info or some part number, that was never included on the original issue part), does this mean a whole new mold was created for this part? Or was the old mold modified to include the changes? Also confirms that RA1028s set are the real vintage deal. I had no doubt that RA1028's parts were an original vintage item. But that revision of the part is for the later Shot cars (Hot Shot II onwards), it is technically not correct for the earlier Shot cars (not that it matters much for the Super Shot or Boomerang, since you clip off the extra plastic anyway). It looks like the original moulds were used, with minor modifications. The parts are otherwise indistinguishable. An extra tab was added to the G parts sprue as well, which is important because these parts actually did change, so it helps identify the changed re-issue parts from the originals. If later Hotshot and Supershot kits were supplied with Hotshot 2 F parts then they are still technically correct. It's what comes in the box from the factory that counts. There are many examples through the years where some of their artwork has been misleading. Are all original Hotshots technically incorrect because they didn't come with gold wheels?